The vessel BECON 3 leaving Tilbury. RWJ ? The containership BEACON 3 (7156 tons gross; capacity 350teu), started life at the Black Sea port of Kherson in the former USSR in 1975 as ALEKSANDR PROKOFYEV. Owned by the Soviet government, it was operated by Baltic Shipping Co, Leningrad (now St Petersburg). 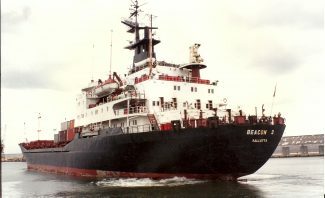 When the communist regime in the USSR fell in 1991, Baltic Shipping became privatised and during the earlier 90s many of its ships were either flagged out or sold. This ship was sold in 1996 to Island Navigation Co Ltd, of Valletta, Malta, as BEACON 3. It later transferred to Belize flag. BEACON 3 retained its “Russian” connection for it was operated by the agency company Morline Ltd, of Gidea Park, long time Soviet/Russian maritime representatives in the UK. 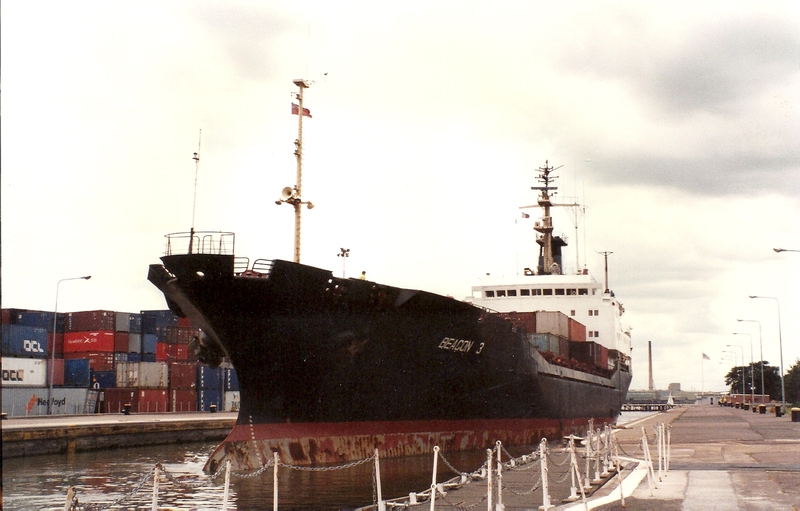 As ALEKSANDR PROKOFYEV the vessel was a frequent visitor to Tilbury Docks in service to Leningrad/St Petersburg, but after its “sale” its trading pattern changed, with its terminal port Bremerhaven in Germany and its destination ports in the eastern Mediterranean. Tilbury became an intermediate port of call. However, before its sale in 1996 the vessel became better known because on 10 January it was detained in Tilbury by the Marine Safety Agency due to its safety equipment certificate being out of date. This was apparently sorted out by the middle of March. Shortly after that the vessel assumed a new identity and was renamed BEACON 3. In October 2005 it had an engine room fire off Crete, was towed to Piraeus and laid up, but did not see commercial service again. It had a career of nearly 30 years and this was doubtless viewed as enough and its damaged engine room not worth repairing. BEACON 3 was sold for over $1.7 million to breakers at Alang, India, and arrived there in August 2006 under the temporary name BEACON, the 3 having been dropped.